When talking with California Girl last week, I mentioned to her that I really wanted to share recipes and tips that make it easy to do something fabulous! Many of us work, and it isn’t easy to whip up something spectacular after a hard day at the office! Truly, you don’t have to be a fancy chef to put something amazing on the table for your family or for guests! Recently, my posts have been for sweets. I love to bake, and my poor husband has to go to the gym just to work off the extra calories I force him to eat when “testing” my recipes. So for his sake, I am going to share with you a chicken recipe that is not only easy to prepare but looks and tastes absolutely amazing! I first made this chicken 35 years ago, and it has been a favorite ever since! California Girl comments: It is always good to have those back pocket recipes that make every home cook look and feel like a real chef in their kitchen. I love how Ms. April makes everything seem so easy to do, but is so yummy. 2 egg whites, slightly beaten with 1 tsp water. 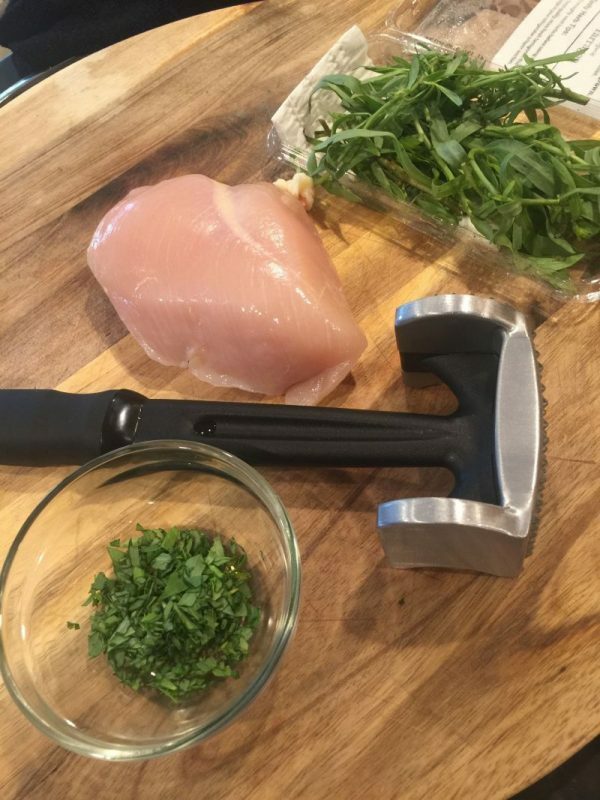 Chicken breasts are pretty thick, so take a meat mallet (use the smooth side, NOT the textured side) and pound them down to a uniform thickness of approximately 1 inch. If you don’t have a meat mallet, use the bottom of a sauce pan. Seriously, it’s fine! 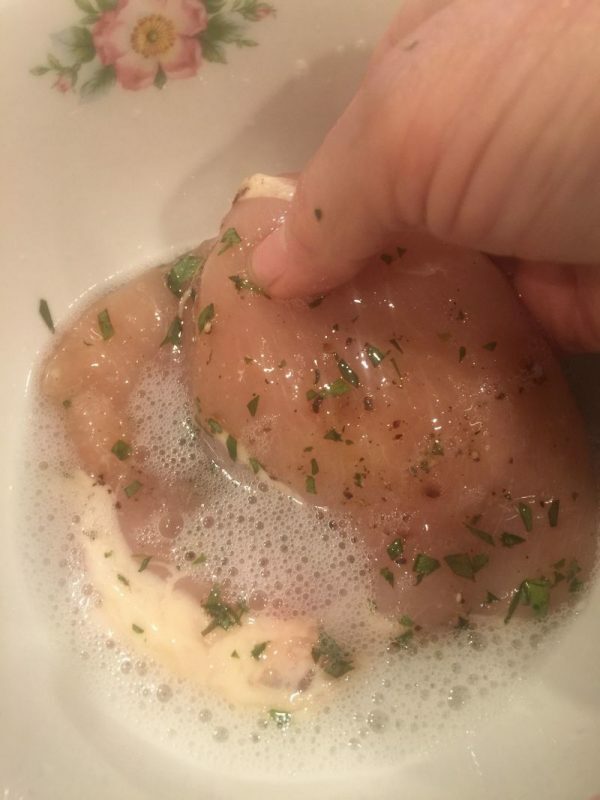 I place the breasts, one at a time, in a quart size zip lock bag (don’t seal it shut, but close it part way so air can escape) and then pound it through the bag. This keeps the mess in one place, and I just discard the bag when I am done! 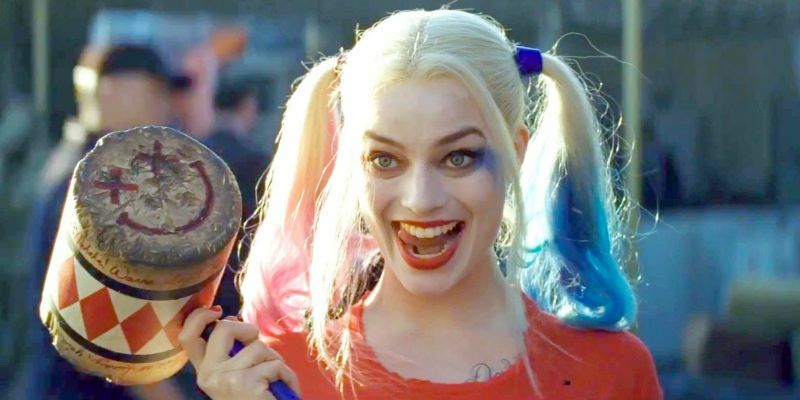 California Girl comments: The Brit won’t let me have a mallet. Hmmm, I wonder why? I guess I’ll have to use a pot for things I want to beat up! Remove the breasts and place them on a plate. Sprinkle with the tarragon, and a little salt and pepper, and allow to rest for 30 minutes. Because it’s chicken, cover it with a paper towel and just place in the refrigerator while it rests. You never want to leave raw chicken out to get to room temperature! 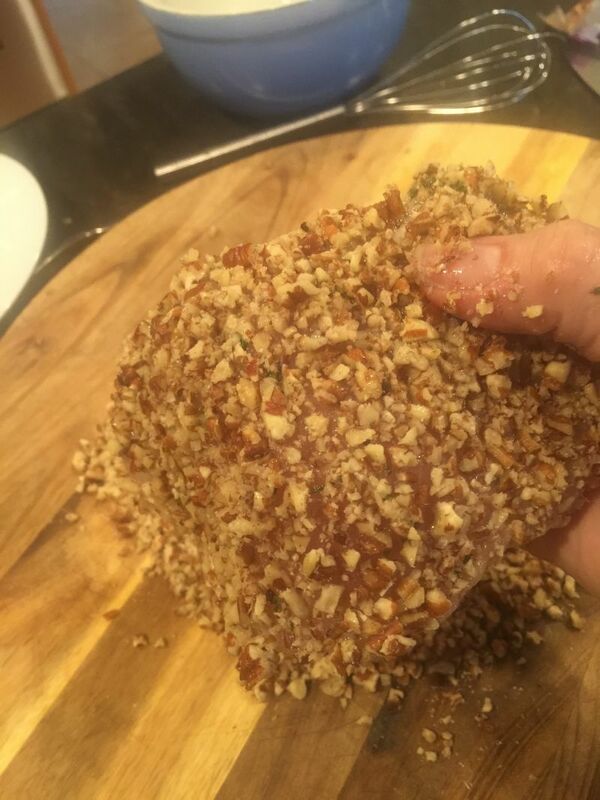 This step also means that you can pound it down and season it ahead of time; just make sure to cover with plastic wrap if you are doing it in advance! 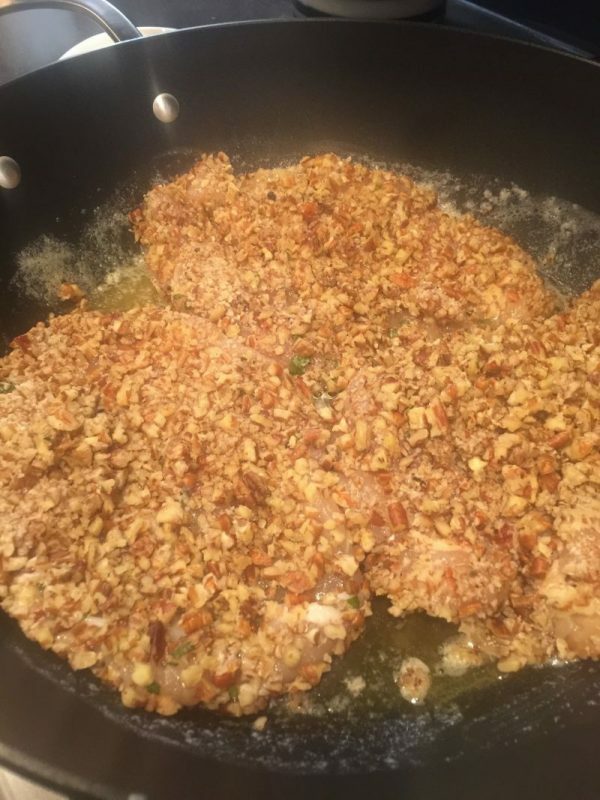 When you are ready to cook, dip the chicken pieces in the egg whites and then press each side into the finely chopped pecans. Using a large shallow skillet, saute in the butter until golden brown on both sides. Remove the chicken from the skillet and keep warm by placing in a plate with an inverted plate over the top of it. 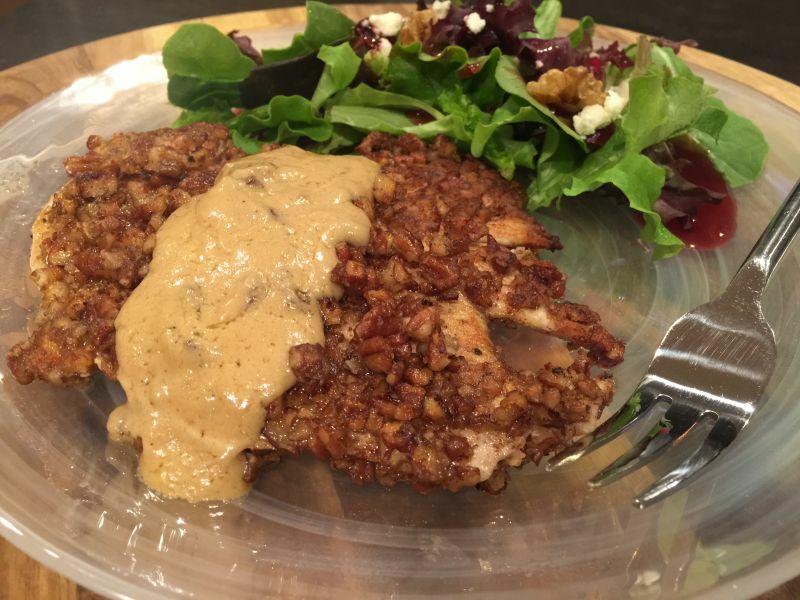 Plate your chicken pieces and spoon a nice portion of the dijon sauce over the chicken and serve! California Girl comments: This week’s wine pairing is going to use our dijon mustard as our guide. Did you know that there is actually a dijon clone of chardonnay? In wine terms, a clone is the subset type of the variety of grape. We wrote about Wente Vineyards 2014 Riva Ranch Chardonnay here. 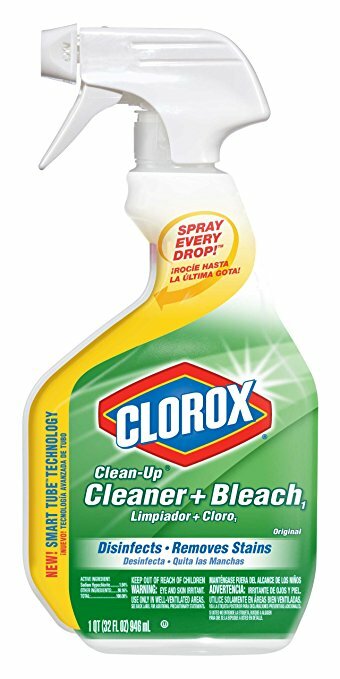 **now here is my kitchen tip—I always have a bottle of Clorox Cleanup under the sink in the kitchen. When I cook chicken, I wipe the cutting board down and then place it in the empty sink and spray it down with Clorox Clean-up. Bleaching your cutting board after using it for chicken is a must, and this product makes it quick and easy! And let me tell you something else about it—if you have a white or almond porcelain sink, you already know that they stain easily! After you wipe the sink out, give it a spray all over with this stuff and let it set. Your porcelain will look as good as new, and everything is disinfected! 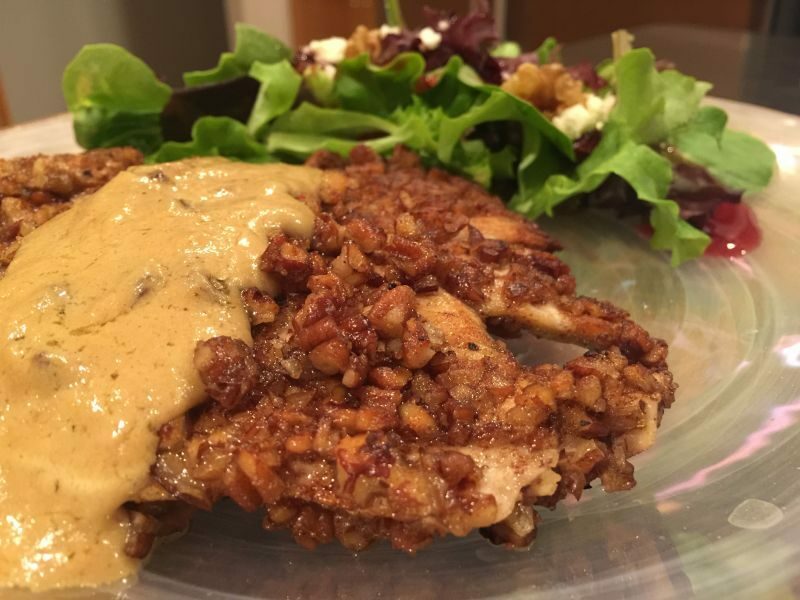 Have a great week, and let me know how you did with this recipe!